Does your resume answer the call of hiring managers? Use these writing tips to put your best skills forward. Does your resume answer the call when it comes to conveying your skills for the best receptionist jobs? To be a successful candidate for top receptionist jobs, resume expert Kim Isaacs says it helps to have a comprehensive resume to your name. 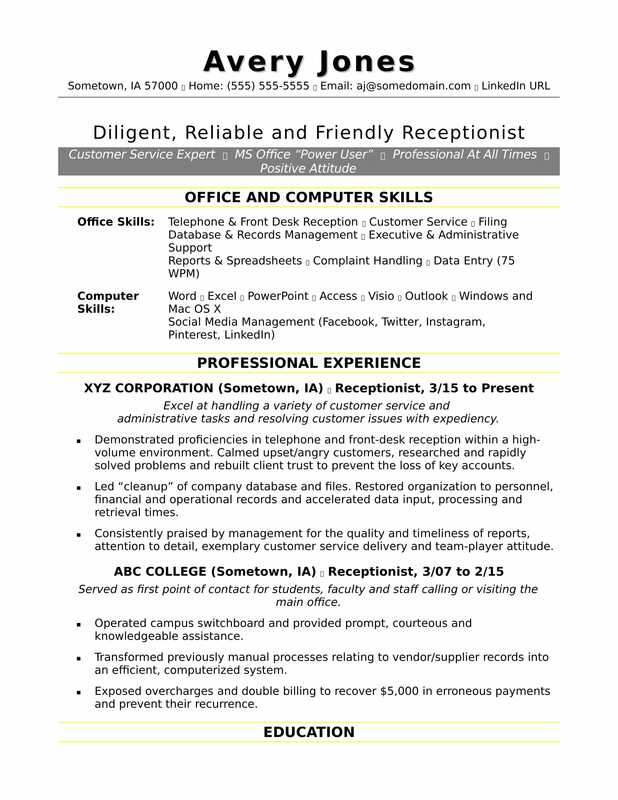 View the receptionist resume sample she created below, and download the receptionist resume template in Word. Jobs for receptionists are projected to grow by 9% (or 95,500 jobs) from 2016 through 2026, according to the Bureau of Labor Statistics (BLS). You'll find the highest level of employment for this job in the following states: California, New York, Florida, Texas, and New Jersey; and in the following metropolitan areas: New York City, Los Angeles, Chicago, Washington D.C., and Atlanta. As a receptionist, you can expect to earn a median wage of $28,390 per year, or $13.65 per hour, according to the BLS. Additionally, you can learn more about administrative careers on Monster. Excel at handling a variety of customer service and administrative tasks and resolve customer issues with expediency. Demonstrated proficiencies in telephone and front-desk reception within a high-volume environment. Calmed upset/angry customers, researched and rapidly solved problems and rebuilt client trust to prevent the loss of key accounts. Led "cleanup" of company database and files. Restored organization to personnel, financial and operational records and accelerated data input, processing and retrieval times. Consistently praised by management for the quality and timeliness of reports, attention to detail, exemplary customer service delivery and team-player attitude. Served as first point of contact for students, faculty and staff calling or visiting the main office. Operated campus switchboard and provided prompt, courteous and knowledgeable assistance. Transformed previously manual processes relating to vendor/supplier records into an efficient, computerized system. Exposed overcharges and double billing to recover $5,000 in erroneous payments and prevent their recurrence. There's a particular type of irritation that comes with making a bunch of calls and not getting any responses—the same goes for sending out resumes. Want to increase the odds that your resume is picked up? Get a free resume evaluation today from the experts at Monster's Resume Writing Service. You'll get detailed feedback in two business days, including a review of your resume's appearance and content, and a prediction of a recruiter's first impression. We won't leave you hanging on.